Visions of Jesus Christ.com - Maria Esperanza - Stigmatist. 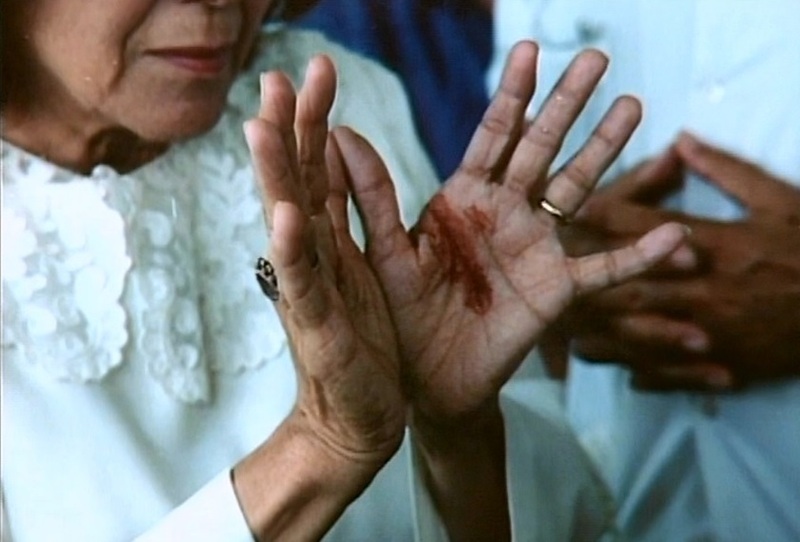 Above image is Maria Esperanza with stigmata. Read [article/biography] on Maria Esperanza. View Maria Esperanza's time-line [here]. Servant of God Maria Esperanza (1928-2004) –A modern day Catholic mystic with a message of hope. Maria Esperanza Medrano de Bianchini was born in Barrancas, Venezuela on the feast day of Saint Cecilia, November 22, 1928. Her mother, Maria Filomena, and father Aniceto Medrano had desperately wanted a daughter, as they already had three boys, and so the mother asked the Blessed Virgin, to grant her a girl. The birth occurred while Maria's mother was taking a trip by boat in search of better medical facilities for Maria’s birth. It was a very painful delivery, and during her pregnancy Maria's mother had often prayed before a picture of the Blessed Mother, offering the child to the Virgin Mary, and promising to name the child Maria (Spanish for Mary) if it was a girl, and Esperanza the Spanish word for "hope". And through the grace of God so came into the world "Mary Hope”, destined to lead others to Jesus through Mary. In obedience to the Virgin Mary, Maria left Rome and arrived in Betania on March 25, which is the feast of the Annunciation. Those gathered there were reciting the Rosary when suddenly Our Blessed Mother appeared to Maria, calling herself "Mary, Reconciler of Peoples and Nations." The Blessed Virgin said to her:"My heart I gave to you. My heart I give to you. My heart I will always give to you." Maria Esperanza was the only one who was able to see her. However, approximately 80 people who were with her at Betania that day witnessed a cloud that came from the forest, as well a remarkable movement of the sun. It was also around this time that the wounds of the Stigmata began to be more apparent. Maria Esperanza always traveled directly guided by the Virgin spreading the message of reconciliation and brotherly unity. Thus she visited many places around the world, always spreading the Word of God in Churches and participating in Marian conferences with the proper ecclesiastical permission. In 1995 she was granted the “Cecilio Acosta” award in Caracas, Venezuela, to acknowledge her valuable contribution as an example and inspiration, and as a promoter of faith and Christian values. Servant of God [Maria Esperanza] de Bianchini, pray for us!